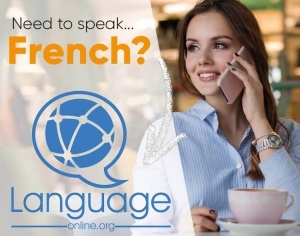 Salut, and welcome to our lesson about French impersonal verbs at Language Easy! Impersonal verbs are those verbs that express an action without a doer. They’re pretty much used when talking about the weather, so master them and you’ll never lack of a conversation starter! What are French impersonal verbs? Que sont les verbes impersonnels? 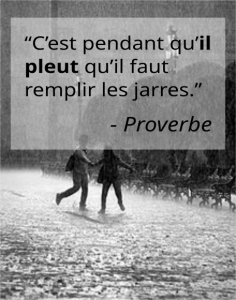 French impersonal verbs (les verbes impersonnels) are verbs that express actions without a doer. They are always conjugated at the neutral third singular grammatical person, generally with the personal pronoun IL. Il pleut tout le temps en Bretagne! It’s always raining in Brittany! Il faut se coucher tôt pour être en forme le matin! Cela arrive que j’aie raison! It can happen that I’m right! Be aware though, there are a lot of constructions that look like it’s an impersonal verb, but it’s not. For example, in the sentence “‘Ça semble juste!” (It sounds fair), the pronoun is in replacement to that something that sounds fair. You can say, maybe, that these words or that agreement sounds fair… In the above examples, you can’t do this, so it’s impersonal. Nothing is raining, it just rains; nothing is happening, it just does. In the following sentences, can you tell which construction is impersonal, and which isn’t ? Regarde Marc, il semble triste. Il semble que quelque chose lui soit arrivé! It seems that something happened to him! Accidentally impersonal verbs (les verbes accidentellement impersonnels) are verbs that are generally not impersonal but also appear in impersonal constructions. Il est bon de penser avant d’agir. It is good to think before acting. Il y a beaucoup de clients. There are a lot of clients. Il arrive de se tromper. It can happen that ones fails. Il semble qu‘il va pleuvoir ! It looks like it’s gonna rain! Il paraît que le dernier Tom Cruise est super! They say that the last movie with Tom cruise is super! It is possible that I be late. to be eager to Il me tarde de rentrer à la maison! I’m eager to be home! Il convient de dire bonjour. as a result Il a résulté du sondage que la populion est d’accord. It resulted from the survey that the population is in favor. to be inferred Il se déduit de son alibi qu’il n’est pas coupable. From his alibi, we can deduce he is not guilty. to be sufficient Il suffit de respirer pour être vivant! It is sufficient to breathe to be alive! to appear Il est apparu que c’est toi qui avait raison. It appeared that you are the one who was right. to bother, to annoy Ça m’ennuie de devoir toujours t’attendre. It annoys me to always have to wait for you. Essentially impersonal verbs (les verbes essentiellement impersonnels) are the verbs that are impersonal by nature; they are never used with a subject other than the impersonal IL. must Il faut que tu travailles plus! You have to work more! s’en falloir Il s’en a fallu de peu pour que tu ne tombes. You were close to falling down. The situation is going to become violent! And now is the moment to fulfill our promise to introduce new vocabulary for your converstation starter ability! There are a lot of regionalism, so I put only the most used ones. Dormir est agréable → il est agréable de dormir. Sleeping is enjoyable → it’s enjoyable to sleep. Travailler est fatigant → il est fatigant de travailler. Il est un pays imaginaire où les ours son bleus. Il pleut de l’eau très polluée. It’s raining a very contaminated water. Il grêle des grelons gros comme des abricots. It’s hailing hails as big as an apricot. So, can you tell the apparent and real subjects in the three first examples of this section? French impersonal verbs are never at the imperative mode, as there is nobody to command if the action has no doer. Essentially impersonal verbs don’t even have an imperative form in their conjugation table. However, if we really need to make such a command, we use the subjunctive instead. Allez, qu’il pleuve un peu s’il vous plaît! Qu’il tombe un peu d’eau… Que ça flotte! Et voilà, we reached the end of our lesson about French impersonal verbs. It’s certainly a step forward in your learning. You’ve learned a lot of new words and expressions today, our next lesson for tomorrow will be about pronominal verbs. Keep going, you’re doing good!